Germany is currently experiencing something of a convulsion over a newly published book (Deutschland schafft sich ab or, Germany Abolishes Itself) that suggests Muslim immigration, on the whole, has not been a net positive experience for the country. MC finds that an unremarkable proposition but in a telling sign of the politically correct world in which we live, the author, central banker Thilo Sarrazin has been demonized and ostracized in a very comprehensive fashion. Make no mistake: there are, apparently, some lame claims about genetics in the book and MC doesn't pretend to endorse them. At this point, we are reading everything in translation and are attempting to put the issue to our readers as fairly as possible. What does seem clear at this point is that the body politic of Germany is seizing upon extraneous claims in order not to deal with Sarrazin's underlying arguments. If those are as we understand at the moment, MC agrees with them. Indeed, there is almost nothing new in commenting upon the lack of integration and assimilation of Muslim immigrants in host countries. It seems, however, that establishment Germany cannot countenance an honest discussion about this fact. MC suspects the book will be a best seller and everyone in Germany will deny buying it. The subject is a big deal and has already come to this country which lacks its own Sarrazin. 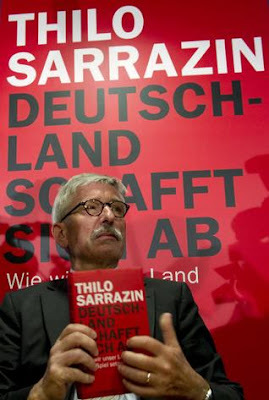 Sociologist Necla Kelek asks in the Frankfurter Allgemeine Zeitung why Sarrazin has simply been demonised when a proper discussion about his book was what was needed. "All this fuss strikes me as somewhat staged and the racism argument smacks of red herring. So he doesn't want to live in a Muslim Germany because he is suspicious of that sort of society. What's wrong with that? The economist in Sarrazin has calculated that the 750,000 Turkish immigrant workers now number almost 3 million and of the able bodied among them, 40 percent live off the state instead of working. This makes no economic sense for him and leads him to ask whether immigration, in its current form, is not a mistake. This is no reason to get upset at Sarrzin, instead we should be asking the politicians who are responsible for this state for affairs whether or not they have really served the interests of the country." For the writer Monika Maron in an interview in Die Welt, the public debate has missed the point: "Why can't we leave aside Sarrazin''s obviously potty ideas about genetic theory and start talking about something much more worrying: the growing confessionalisation of our society, the millions of euros we are shelling out in welfare cheques, the deficits in education and the criminality of Muslim youth? Government schemes and vast sums of money have done little or nothing to change a situation that has been well-known for many years. What has to happen?" In the Frankfurter Rundschau, Markus Tiedemann, a professor of educational philosophy dismisses Thilo Sarrazin's nonsensical hereditary theories in two paragraphs, before turning on some of Sarrazin's critics who, he says, are no better. "In 2007 Pascal Bruckner, a representative of the French mouvelle philosophie, tried to rock the self-satisfied boat of political correctness. His concept of the 'racism of the anti-racists' exposes the negative dialectic of multicultural tolerance. ... Anyone today who claims that it is too much to expect 'the Muslims' to embrace the achievements of the modern age such as emancipation and freedom of opinion, are no better that the voices who used to say that the blacks lacked the maturity to vote." Mr. Sarrazin’s thesis is that Germany’s demographic decline, coupled with the supposedly low educational attainment and cultural alienation of the Muslim immigrant population, will lead ultimately to the abolition of German culture. “The departure of Germany from history is deeply worrying to me, he said. Mr. Sarrazin’s speech was preceded by an introduction by equally controversial Turkish—German intellectual Necla Kelek, who believes that Islamic values have hindered the integration of Muslim immigrants into German culture. “A responsible citizen has spoken bitter truths,” Ms. Kelek said, calling for a discussion of the book’s contents rather than moral issues. “This book, despite the reaction, will change politics in this country,” she added.